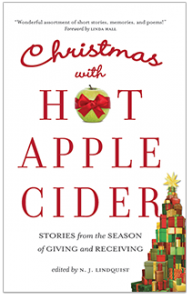 Grace Wulff’s story The Christmas Ornaments is included in the just-released book, Christmas with Hot Apple Cider. Grace is one of 55 writers from across Canada who survived a rigorous competition to be included in this Canadian anthology, fifth in a series of books designed to entertain, encourage, and inspire. Christmas with Hot Apple Cider: Stories from the Season of Giving and Receiving is an eclectic collection of true stories, short fiction, and poetry. Grace’s story is about the gift of ornaments for those who needed it most, for those who were in hospital through the Christmas season. It is about the joy of giving, for those who created the ornaments and the ones who received them. To purchase the book directly from Grace click here. It is also available on Amazon and in Kindle form.